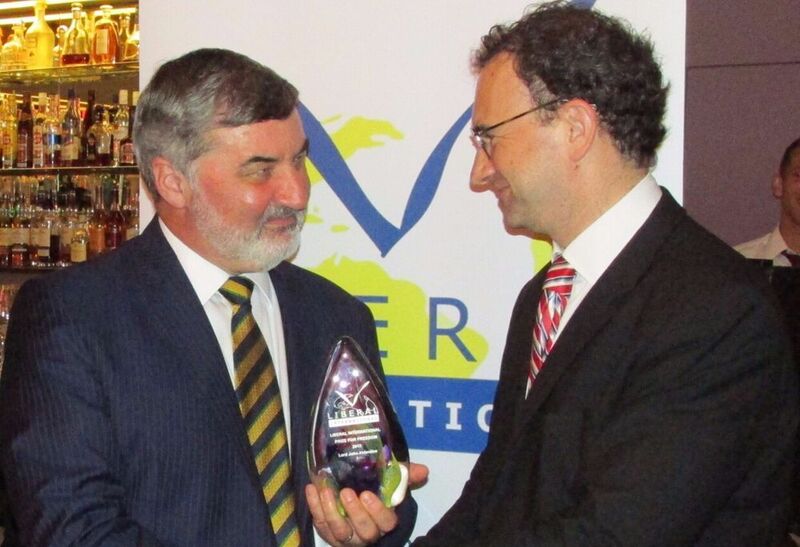 The Chairman of CDPB has been presented with the 2015 Liberal International, Prize for Freedom, by LI President, Dr Juli Minoves, at a ceremony in Zurich in June in the presence of many liberal politicians from around the world. The annual Prize for Freedom is Liberal International’s highest recognition and has been awarded each year since 1985 to an individual who is seen as having made “an exceptional contribution to the advancement of Human Rights and Political Freedom”. Previous laureates of the Prize for Freedom have come from across the world and have included, Helen Suzman, Aung San Suu Kyi, President Mary Robinson, President Vaclav Havel, Prime Minister Benazir Bhutto, Hans-Dietrich Genscher and President Corazon Aquino. The first recipient in 1985 was former Argentinian President, Raul Alfonsin for his various contributions to peace in South America. The nomination for the 2015 Prize for Freedom came from the German Group of Liberal International which cited “Lord Alderdice’s contribution to negotiating the Good Friday Agreement in Northern Ireland and his participation in peace missions around the world….work which continues particularly through his Directorship of the Centre for the Resolution of Intractable Conflict, based at Harris Manchester College, University of Oxford”.